The government is promising to abolish 4,700 Whitehall performance targets for councils in England. 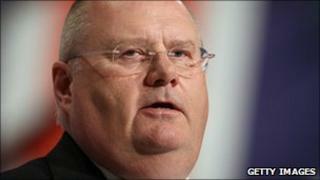 Communities Secretary Eric Pickles said less money would be spent on "form-fillers and bean-counters", allowing more focus on frontline services. Local Authority Agreements will be replaced with a single list of "data requirements" agreed between councils and central government, he added. The agreements were introduced by the Labour government in 2005. Lasting for three years, they are described on the government's Idea website as "action plans for achieving better outcomes, developed by councils with their partners in local strategic partnerships". Mr Pickles said that, in future, councils would be able to set their own performance targets, which would be judged by people in their areas, rather than Whitehall. He added: "Time and time again, I hear complaints from councils about how much of a burden the national indicator set is. "Not because measurement and targets are always a bad thing. But national targets tend to mean that councils are constantly working on things which matter to Whitehall, regardless of what local residents think. "I'd much rather councils were tackling local issues. The money being spent on form-fillers and bean-counters could be far better spent helping elderly people to stay in their homes. "So, I'm scrapping the existing local area agreements. I'm handing over control for over more than 4,700 targets to councils and their voters. To keep them or dump them as they see fit." In a speech in west London, Mr Pickles also said the "days of throwing money at problems are over". The communities secretary said a project carried out between Leeds Council and the credit rating firm Experian had resulted in the recovery of £500,000 in overpayments to suppliers. Internal auditing by Islington Council had found £55,000 in overpayments, with some some bills being paid two or three times. Mr Pickles said this showed councils were effectively "letting money slip through their fingers". The new rule that spending over the value of £500 should be published online would help stop duplicate payments, he argued.